Notes: The College and Hospital buildings are situated at No. 233 East Baltimore street, in a section of the city replete with clinical material for Dispensary and Hospital purposes.The Free Dispensary will be opened daily from 12 to 2 o’clock, at which large numbers of out-door The advantages derivable from this mode of teaching can hardly be overestimated. 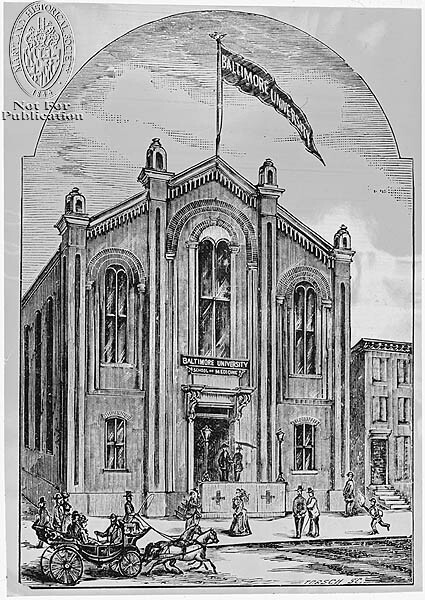 This large and extensive charity, belonging to the City of Baltimore, is now accessible to all Medical Students, free of charge; and it offers advantages for studying and seeing almost every form and variety of disease and accident that can be found anywhere. With its 1,000 beds it is more convenient in distance to the Baltimore University than to any other college in the city; and the cars going thither pass the doors of the College. Notes: The course of instruction will be didactic and clinical, and rendered thoroughly practical and progressive in all departments of a complete medical education. Thus, Laboratory instruction and manipulations will form a prominent feature in the curriculum, and students will be made familiar with the instruments and appliances so often called for in modern practice. Notes: Students must be possessed of good moral character, and unless matriculates of some literary institution or medical college, will be required to furnish sufficient evidence of possessing a good English education. Candidates for graduation must have attended at least two courses of lectures in this College, or one course in this after having attended one or more courses in some college recognized by this Faculty. The fitness of a candidate for graduation will be based upon good moral character, and regular attendance upon the instruction afforded by the College, and upon the result of a final examination, to be determined by a majority of all the votes of the Faculty. The Hospital is connected with the College, and will supply the students with all the clinical advantages. In the wards every variety of disease and injury in treated, so that the students have ample opportunity for bedside instruction, making this one of the most practical schools.The Faculty desire to particularly call the attention of students to the superior advantages they have in hospital practice. They are invited and are expected to attend with the physician in charge, during his visit to through the wards, thereby practically making diagnoses of diseases at the commencement of their studies. In surgery, they act as assistants, acquiring the knowledge and use of instruments, applying bandages, and administering anesthetics, as well as becoming experienced in surgical operations, which are varied, and probably more extensive than in any other hospital in the country. Notes: The Clinical instruction is given under the supervision of the various Professors. The Faculty would call attention of students, that these Clinics are larger than any other Medical Institution in the United States. And the system of forming small classes, gives each student an opportunity of seeing more cases of actual diagnosis and treatment than is usually seen in many years of practice. There will be a quiz every Tuesday and Thursday night by a member of the Faculty during the entire session. It is compulsory that every student must be present. Notes: The College and Hospital buildings are situated on North Bond, near Baltimore Street, in a section of the city replete with clinical material for dispensary and hospital purposes. Although these buildings have been sufficiently extensive and commodious during the past history of the University, they have now been found inadequate to meet our increasing demands, and during the present year vast and desirable improvements have been made since the last session. The hospital has been entirely reconstructed and many new wards and private rooms added. Operating rooms have been provided for the surgeons. Chemical, physiological and pathological laboratories have been added, affording every facility for these branches. The lecture-rooms have been admirably arranged and furnished with folding chairs and all other conveniences which may be required. The entire building is supplied with steam heating apparatus. Notes: The session of 1896-7 was the most successful one in the history of the college, and the faculty are stimulated and encouraged to such an extent that new college and hospital buildings are in contemplation and will be an accomplished feat in the very near future. Additional laboratory facilities have been added since the close of the last session, the corps of instructors has been enlarged, and the session has been lengthened as hereinafter described. In pursuance of this policy the faculty is in position to offer to students of medicine, a course comprising diadactic, clinical, and laboratory instruction, second to none in this country. Notes: Obstetrics will be taught in a practical manner. Illustrations will be furnished by diagrams, plates and all modern appliances. The Lying-In Hospital will afford unexcelled opportunities for the demonstration of this branch. The use of forceps and all other obstetrical instruments will be shown on the patients. This department is supported solely by the University, is directly under its immediate control and adjoins the general hospital. Students have at all times access to it, under the direction of the Professor of Obstetrics, and in cases of labor are called upon to assist. Members of the graduating class are taken in squads of three or four students each and are notified promptly whenever labor occurs. These squads are assigned in rotation to attend labor cases in the hospital under the immediate supervision of the Professor of Obstetrics, they are thoroughly instructed in vaginal examinations and the antiseptic precautions to be taken in making such examinations, abdominal palpation, the diagnosis of presentation and in the treatment of the case preparatory to, during and after labor. Notes: The development of the body, as well as the mind, is now an ackowledged requisite. Universities are generally recognizing the wisdom of encouraging athletics, and including them in their regular curriculum. Physical culture will, therefore, receive necessary attention in the Baltimore University, School of Medicine but not to an extent to interfere with regular medical studies. Outdoor sports will be excouraged [sic] by the Faculty, and football and baseball clubs will be formed immediately upon the opening of the school. The University owns a complete outfit for football, and it will be placed at the disposal of clubs during the session.